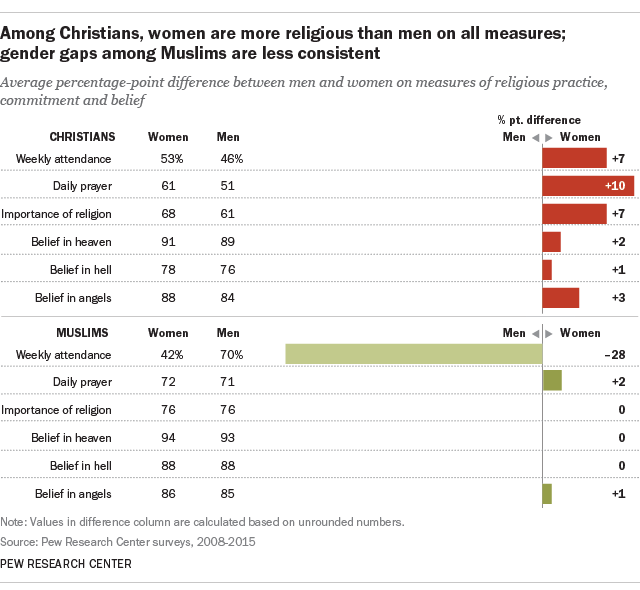 One of the most striking findings in a new Pew Research Center analysis of survey and census data on gender and religion is that while Christian women are on the whole more religious than Christian men, Muslim women and Muslim men have similar levels of religious commitment. And when it comes to attendance at worship services, Muslim men are more active than Muslim women. This assessment emerges from data collected in scores of predominantly Muslim and predominantly Christian countries comparing men and women on several key measures of religious commitment. For instance, Christian women report praying daily more frequently than Christian men by an overall average of 10 percentage points (61% vs. 51%) across 54 countries where data are available. In some countries, the gap is much bigger, ranging up to 25 percentage points in Greece. By contrast, Muslim women are about as likely as Muslim men to report praying daily as (72% vs. 71%) across 40 countries where data are available. Christian women also are more likely than Christian men – by an average of 7 percentage points (68% vs. 61%) – to say religion is “very important” to them. In some nations, such as Peru, Chile and the U. S., this gap expands to 10 percentage points, and in South Korea it reaches 23 points. But among Muslims, there is no difference between the shares of Muslim women and Muslim men (76% vs. 76%) who say religion is very important to them across 38 of the 40 countries with data on this measure of commitment. 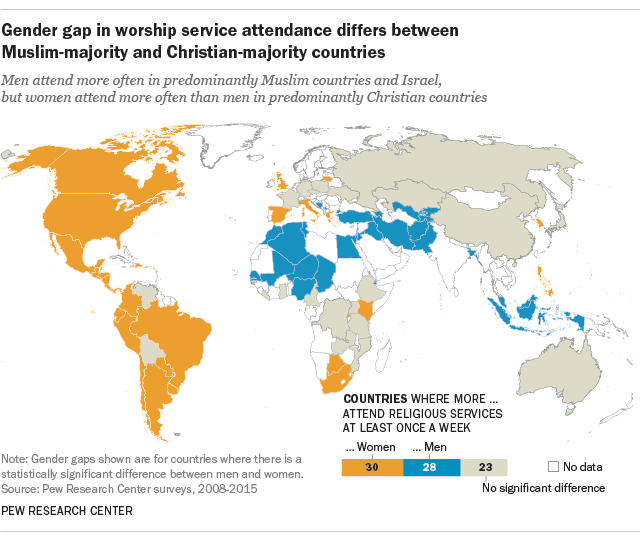 Another area where Christians and Muslims differ is attendance at worship services. Many more Muslim men than Muslim women (70% vs. 42%) report attending services weekly across the 39 countries with data on this subject, leading to a large average gender difference of 28 percentage points. Greater attendance levels among Muslim men are due in large part to the fact that in most Islamic countries, Muslim men are expected to attend Friday midday prayers in a mosque, while women are not. Women can fulfill their prayer obligation individually, either inside or outside the mosque. When it comes to attendance among Christians, however, Christian women are more likely than Christian men – by an average of 7 percentage points (53% vs. 46%) – to report attending services weekly across 53 countries where data exist on this subject.